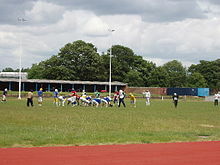 The Linford Christie Stadium is an athletics stadium in West London, England. It is used by one of the United Kingdom's leading athletics clubs, the Thames Valley Harriers. It is also used by one of the United Kingdom's leading hockey teams, PHC Chiswick. The venue first opened as the West London Stadium in 1967. It initially had a cinder track, which was upgraded to synthetic in 1973. Since 1993 it has been named after one of the club's most famous athletes, Olympic 100 metres gold medallist Linford Christie. There is a covered indoor straight. The venue was redeveloped between 2004 and 2006, when additional facilities for sports including football, rugby and hockey were installed. The work was funded by London Borough of Hammersmith and Fulham, the Football Foundation, Chelsea Football Club and Barclays Bank. Chelsea players John Terry and Shaun Wright-Phillips attended the re-opening. The video for "So Many Roads" by Example was filmed here. QPR have plans to redevelop the site into a 30,000 seater stadium with a nearby athletics track for Thames Valley Harriers, currently the plans are only at an early stage. ^ "Example - So Many Roads". YouTube. 6 August 2007. Retrieved 7 July 2018. ^ "Example - Making The Video". Mtv.com. Retrieved 7 July 2018.